A new £65 million National Manufacturing Institute for Scotland (NMIS) is to be built at Inchinnan near Glasgow, with Strathclyde University announced as the anchor university. Work to build the centre, which will help manufacturing businesses throughout Scotland become world leaders in innovation, will begin next year. 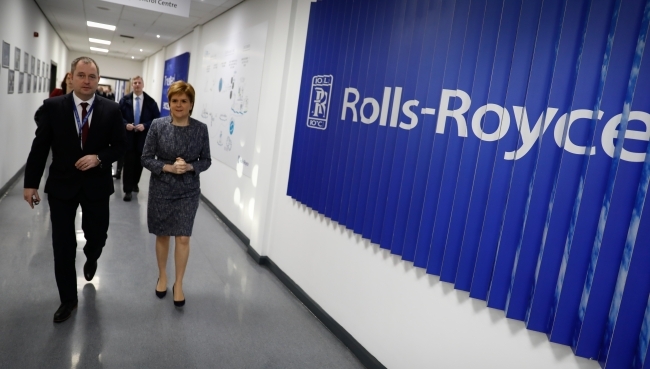 First Minister Nicola Sturgeon and Economy Secretary Keith Brown made the announcement during a visit to Rolls-Royce’s manufacturing facility in Inchinnan. Rolls-Royce is a founding member of the University of Strathclyde’s existing Advanced Forming Research Centre. Speaking after a meeting with some of Scotland’s leading manufacturing companies, the First Minister said: “This exciting facility will be an industry-led international centre of manufacturing expertise. Research, industry and the public sector will work together to transform skills, productivity and innovation, attracting investment and making Scotland a global leader in advanced manufacturing. “It will help companies right across Scotland embrace new manufacturing techniques, support cutting-edge research and help to further develop the skills of our workforce. The manufacturing jobs of the future offer exciting and rewarding careers for young people. We want to inspire them to work in this sector and revive Scotland’s proud tradition of manufacturing and engineering. “Inchinnan provides a gateway to the world through proximity to the airport and revives Scotland’s proud tradition of manufacturing and engineering. “Although the centre will sit on the Clydeside, the benefits will be felt throughout Scotland. Economy Secretary Keith Brown added: “Manufacturing is a key industry, already accounting for 52 % of Scotland’s international exports, and nearly £600m of Scotland’s spend on business research and development. Professor Sir Jim McDonald, Principal and Vice-Chancellor of the University of Strathclyde, said: “Today’s announcement marks the beginning of a new chapter for Scottish manufacturing, building on a great tradition of innovation. By capitalising on world-class, industry-relevant research and supporting skills-development, the new institute will attract inward investment to Scotland, stimulate the creation of jobs and help companies compete globally.